The galaxy is a member of the Virgo Cluster. It has an apparent magnitude of 10.4 and lies at a distance of 55.7 million light years from Earth. Its designation in the New General Catalogue is NGC 4254. The Coma Pinwheel occupies an area of 5.4 by 4.7 arc minutes of apparent sky, which corresponds to a linear diameter of 85,000 light years. It is one of the brighter spiral galaxies in the Virgo Cluster and appears almost face-on, which makes it a popular target for both professional and amateur astronomers. The galaxy can be seen in small telescopes, but only appears as a dim ball of light with a brighter centre. 8-inch telescopes reveal a hazy patch of light with a more clearly defined centre. 10-inch telescopes begin to hint at the spiral structure under good conditions, and larger instruments reveal the galaxy’s dust bands and other details. 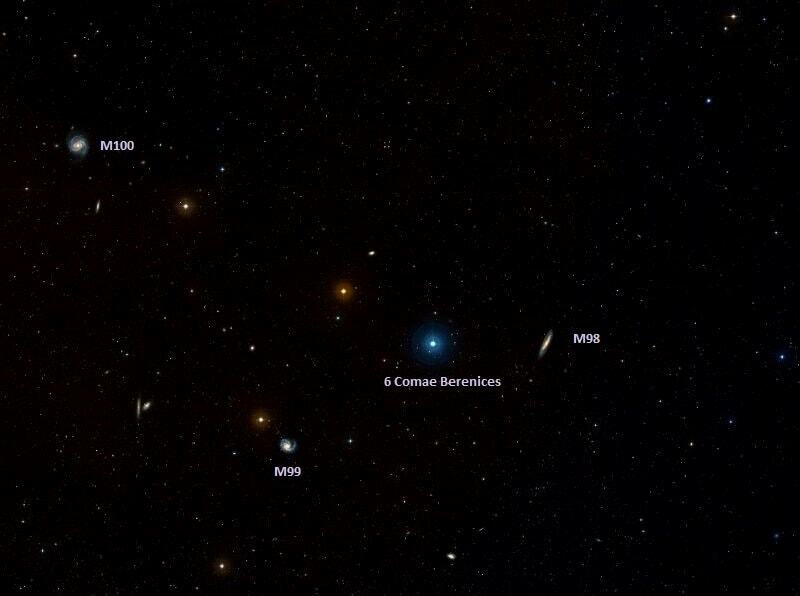 Messier 99 can be found 7 degrees east of the bright star Denebola in Leo or just under a degree southeast of the magnitude 5.1 star 6 Comae Berenices, which lies 0.5 degrees east of the edge-on spiral galaxy Messier 98. The best time of year to observe M99 and other galaxies in the Virgo Cluster is during the spring. Messier 99 is a grand design spiral, completely unbarred and with two giant spiral arms. One of the spiral arms is normal and the other appears distorted. M99 is slightly asymmetric in shape, with the nucleus shifted from the galaxy’s centre, likely as a result of interactions with other galaxies in the Virgo Cluster. 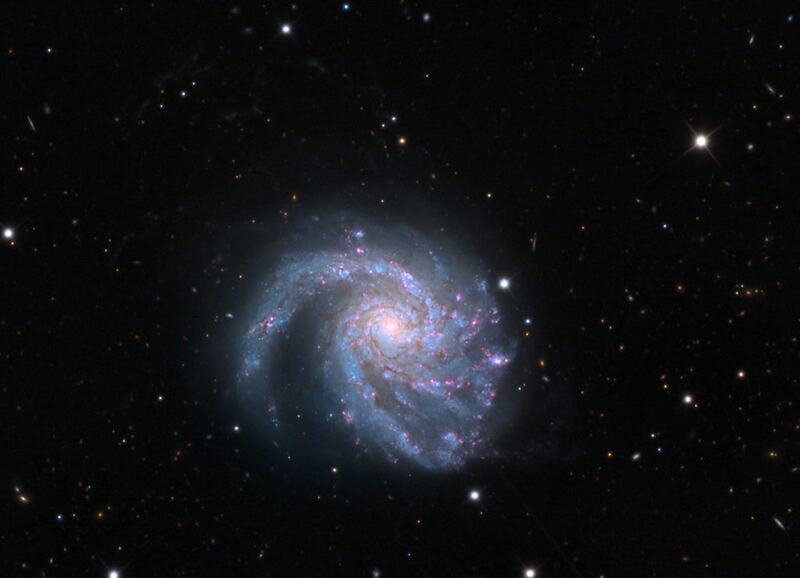 M99 rotates clockwise and is classified as an Sc type spiral galaxy. It is receding from us at an unusually high velocity of 2,407 km/s. This is the highest redshift recorded for any Messier object. 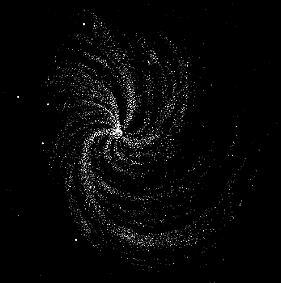 Even though the Virgo Cluster Pinwheel has a diameter of 80,000 light years – almost the same size as the Milky Way –with an estimated mass of 50 billion solar masses, it has only 5 percent of our galaxy’s mass. The M99 galaxy has a normal looking arm and an extended spiral arm that appears less tightly wound. The galaxy is linked to the nearby VIRGO HI21 by a bridge of neutral hydrogen gas. The gravity from VIRGO HI21, an extended region of neutral hydrogen (HI) and suspected dark galaxy, is believed to have drawn out the gas bridge and distorted M99 in a close encounter. 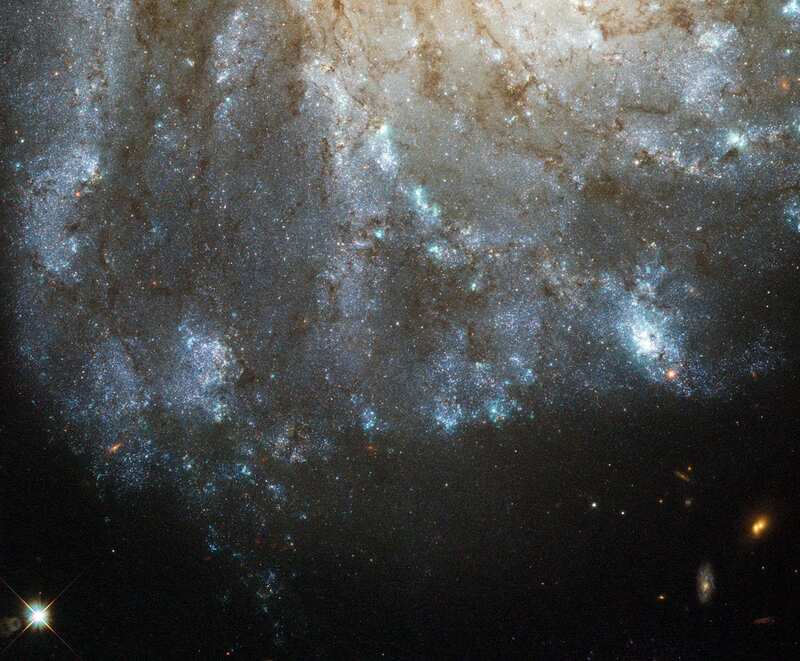 However, as the existence of the dark galaxy is unclear, M99 may have instead interacted with the lenticular galaxy NGC 4262 about 280 million years ago. As a result of the encounter, the star forming rate in M99 is three times greater than in other galaxies of similar type. Some sources believe that M99 is currently entering the Virgo Cluster and is experiencing ram-pressure stripping and losing hydrogen as it moves through the densely populated intracluster medium. Four supernovae have been detected in the Coma Pinwheel: SN 1967H (Type II, mag. +14) in June 1967, SN 1972Q (Type II, mag. +15.6) on December 16, 1972, SN 1986I (Type I, mag. 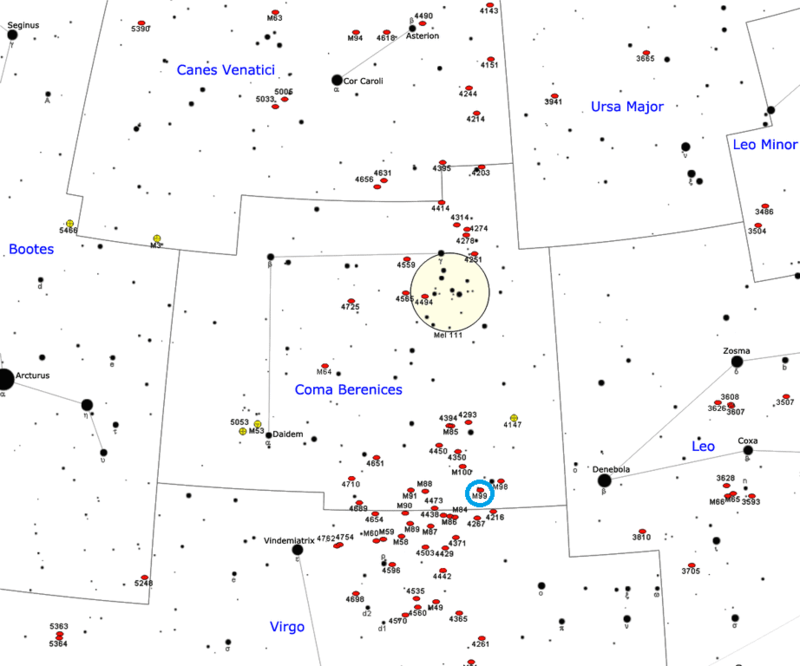 +14) on May 17, 1986, and SN 2014L (Type Ic, mag. +15.4) on January 26, 2014. Located on a spiral arm of Messier 99, PTF 10fqs has a peak luminosity of Mr = -12.3, red color (g-r = 1.0) and is slowly evolving (decayed by 1 mag in 68 days). It has a spectrum dominated by intermediate-width H (930 km/s) and narrow calcium emission lines. The explosion signature (the light curve and spectra) is overall similar to that of M85OT2006-1, SN2008S, and NGC300OT. The origin of these events is shrouded in mystery and controversy (and in some cases, in dust). PTF10fqs shows some evidence of a broad feature (around 8600A) that may suggest very large velocities (10,000 km/s) in this explosion. Nebula without star, of a very pale light, nevertheless a little clearer than the preceding [Messier 98], situated on the northern wing of Virgo, & near the same star, no. 6, of Comae Berenices. The nebula is between two stars of seventh & of eighth magnitude. M. Méchain saw it on March 15, 1781. Drawing of M99 by William Parsons, 3rd Earl of Rosse in 1848. 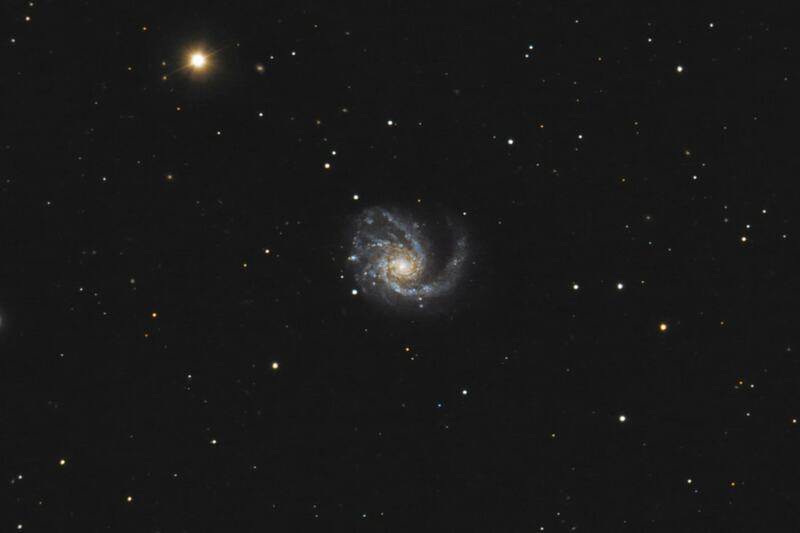 Messier 99 was one of the first spiral galaxies in which a spiral pattern was recognized. The spiral pattern was first observed by William Parsons, 3rd Earl of Rosse, in the spring of 1846. M99 was the second object Lord Rosse recognized as a spiral, after the Whirlpool Galaxy (M51), which he had discovered about a year before M99. Rosse used his 72-inch reflector at Birr Castle in Ireland for the observations. A very bright, approximately round spiral 4.5′ in diameter. Nucleus almost stellar. There are two main whorls, rather open, which show many almost stellar condensations. M. 99. 47 s.n.